Crimson Corner makes most of its money now from tobacco products, snacks, drinks, and other nonprint items. It’s long been a tradition among visitors to Harvard Square: browsing at one of the two outdoor newsstands that are as much part of the fabric of the square as the storied university. 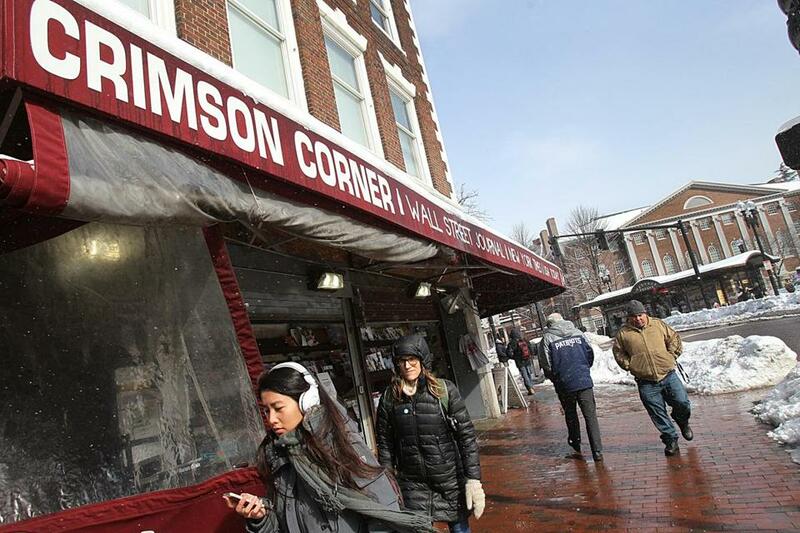 Now, there is a chance Harvard Square may end up with none, as family-owned Crimson Corner has been asked to leave its location of five decades, while Out of Town News may have to vacate the iconic kiosk at the center of the square. Crimson Corner, across the street from Out of Town News, must leave its corner perch by the end of February, as the landlord wants the location, to be replaced by &pizza , a Washington, D.C.-based chain. Both newsstands have been battling twin fronts: rising real estate costs and the encroachment of chains in Harvard Square, and the advent of digital media that has undermined the print publishing business. In November, &pizza announced plans to expand into major US cities after receiving a $25 million investment from Boston firm AVALT. The proposed Harvard Square location, which includes the adjacent space vacated by restaurant Tory Row, is slated to have 62 seats, including a 10-seat patio on the sidewalk where Crimson Corner currently has its rows of magazines and newspapers. Crimson Corner owner Chris Kotelly said he was kept in the dark about the property until December, when he was told his newsstand had to be out by the end of January. He has since gotten a one-month extension. Kotelly said he is a tenant-at-will of the Dow Stearns Trust, but the building next to the Harvard Coop is listed as being owned by Brattle Street Properties LLC and managed by Colliers International in Boston. Calls for comment to Colliers and to a lawyer representing Brattle Street Properties were not returned. In the meantime, Kotelly said he would like to remain in Harvard Square, but the available spaces are either too big or too expensive. Harvard Square is frequented by about 10 million people a year. Out of Town News, across the street from Crimson Corner, could also soon lose its spot in the heart of Harvard Square. Like Out of Town News, Crimson Corner has served academics, students, residents, and visitors for decades. The bulk of its sales, however, no longer come from newspapers or magazines, but from tobacco products, Harvard University-branded souvenirs, and drinks and snacks, he said. 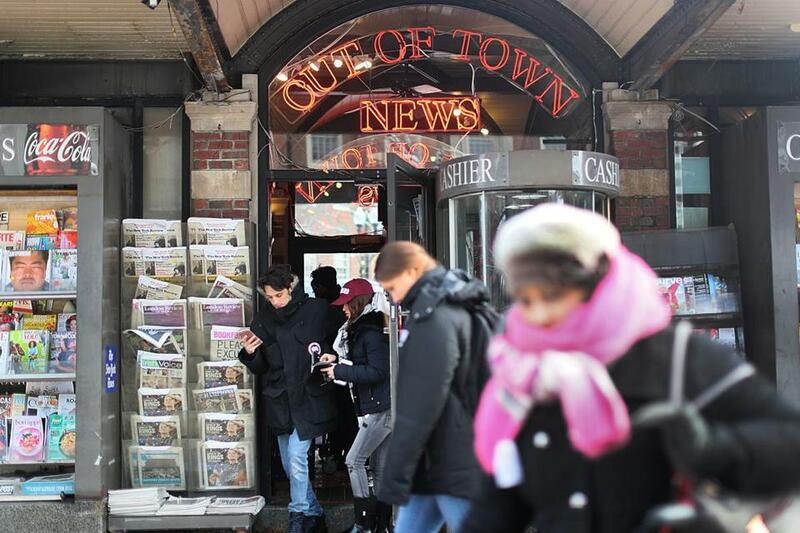 The possible departure of the newsstands, said Denise Jillson, executive director of the Harvard Square Business Association, follows the steady loss of other businesses, such as record and music stores, and photography and camera film shops. “Now we have one of each. That’s the way things are. When you look at both those [newsstand] businesses, you realize they couldn’t pay the rent if they were just selling newspapers,” Jillson said. “I’m not saying we shouldn’t have newsstands in Harvard Square, but to have two right across from each other, if you see what they’re actually selling and how they’re making their money, it’s not through newspapers. For Out of Town News, the ax may not fall so quickly — yet. Cambridge is planning a nearly $5 million redesign and renovation of the brick plaza, and city officials last year suggested Out of Town would have to leave because residents would prefer the kiosk be used by the public, not a private business. The kiosk is owned by the city, and officials said they are still gathering feedback on the kiosk. A resolution on the kiosk is not expected before fall, meaning that Out of Town News will remain where it is, at least until then. This is good news for owner Mike Patel, who said in an interview Monday that he too would like to remain in the square. But for Crimson Corner, time is running out quickly. The developers behind &pizza need a special permit to serve food on the current Crimson Corner side. Kotelly, a third-generation owner, said he is hopeful that if the developers don’t get that permit, then maybe he will be allowed to stay.